Sanitaire vacuum bags style Z OEM # 63881A. Premium allergen vacuum bags help trap 90% of allergens, grass, weed pollen, dust mite debris and household dust. 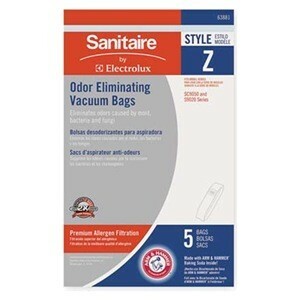 These Sanitaire vacuum bags fit the Sanitaire Duralite series SC9050A and S9020 vacuum cleaners.